The Sin and Punishment universe (罪と罰, Sin and Punishment) is a series of on-rails shooters set in a dystopian future published by Nintendo and developed by Treasure. The first game, originally released only in Japan for the Nintendo 64 as Sin and Punishment: Successor of the Earth was released on the Wii Virtual Console in the rest of the world in 2007. Sales were sufficient for a sequel, called Sin and Punishment: Star Successor in the US, Sin and Punishment: Successor of the Skies in Europe, and Sin and Punishment: Successor of the Universe in Japan to be developed and released worldwide on Wii. 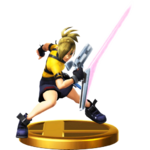 Saki Amamiya, the series' lead character, appears as an Assist Trophy in Super Smash Bros. Brawl. When summoned, he will run and jump around, slashing at opponents with his saber, and firing energy blasts from his gun. Saki can also shoot from his gun while jumping, inwhich instance he would shoot at a pseudo-downward angle. However, Saki is liable to jump off of the side of the stage and self-destruct. Saki returns from Brawl as an Assist Trophy, with the same function as he had in Brawl. Saki does not reprise his role as an Assist Trophy. However, he does appear in the game as a Spirit (In addition to his son, Isa Jo, as he appears in Sin & Punishment: Star Successor) and a Mii Costume. This page was last edited on February 24, 2019, at 04:04.